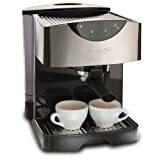 Have the ability to make coffeehouse quality espressos and cappuccinos in the comfort of you own home. The Mr. Coffee 15-bar pump espresso maker delivers high-quality drinks on a consistent basis. The thermal block heater makes brewing faster and a removable water reservoir makes it easier to get started.